It's a state of mind, a way of thinking and a belief system bordering on outright religion all in one. If it would be recognized as a religion, it would be the world's biggest. Its followers and proponents hold that growth is a necessary element of survival, that technology is capable of solving all problems (especially those caused by mankind), and that the earth, nature, the living environment, is there for mankind to be exploited at will to achieve that growth. What puts it so close to being a religion is that it doesn't like to question it own assumptions, let alone have them questioned by others, and anyone who does so anyway is ostracized. One group of people that fits the description to a tee is the current British government. It would be hard to find anyone in the world outside of corporations involved who promote genetically modified food as fervently as Downing Street 10 and its crew. Likewise, there probably is no government that's as convinced of the blessings of the shale and fracking industry as Prime Minister David Cameron and his lieutenants. Until recently, the Polish government might have given them a run for their money, but in Poland the entire industry essentially died in just the past few months. Just last week, I wrote an article named Shale Is A Pipedream Sold To Greater Fools, a title which of course kind of gives away my position on the shale issue. Still, if you read it you can see that position isn't primarily based on environmental issues; I simply looked at the numbers and started questioning the assumptions. Comments to the article said things like: "… the US has seen a huge rise in production of both oil and gas..! , but that wasn't not my point: what I'm questioning is what's extrapolated from today's data, for tomorrow. 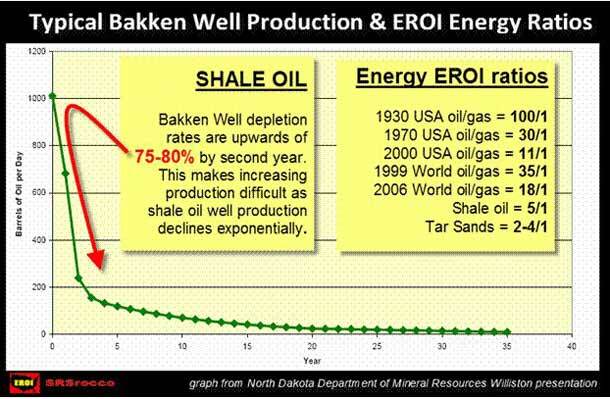 People assume all too easily that what is produced today will be also be produced well into the future, maybe because of how conventional oil and gas typically play out, but the 40% depletion rates for the average well at the Bakken play today, put together with the undoubtedly worsening future rates, for ever more, and inevitably ever more marginal, wells, don't paint a rosy picture. It may all look fine today, but looking at the numbers I don't see how it can still look good even a few years from now. Chancellor George Osborne has pledged to make Britain's tax regime the "most generous for shale in the world" as the Treasury pressed ahead with promised tax breaks for fracking firms. "I want Britain to be a leader of the shale gas revolution – because it has the potential to create thousands of jobs and keep energy bills low for millions of people," Mr Osborne said. Fracking has become a national debate in Britain – and it’s one that I’m determined to win. 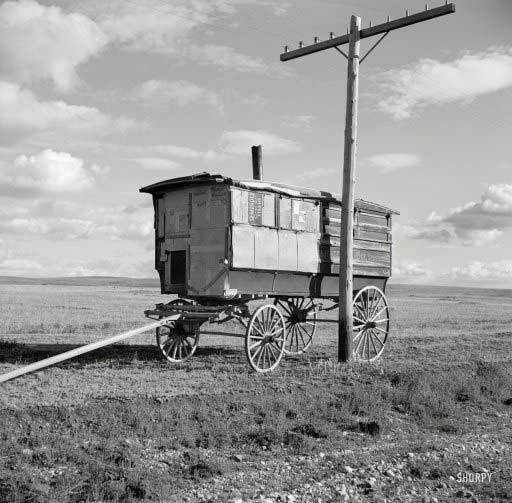 If we don’t back this technology, we will miss a massive opportunity to help families with their bills and make our country more competitive. Without it, we could lose ground in the tough global race. As with any advance in technology, fracking – drilling for so-called “unconventional” gas – has rightly drawn scrutiny. But a lot of myths have also sprung up. So today I want to set out why I support it – and deal with the worst of the myths at the same time. Always nice to see that someone on one side of a debate says something like "a lot of myths have sprung up, without feeling the need to specify which side of the debate these myths have come from. Me? I'm the Prime Minister, I don't spread myths!! First, fracking has real potential to drive energy bills down. Labour’s mismanagement of the economy means that many people are struggling with the cost of living today. Where we can act to relieve the pressure, we must. Also great. It's almost as if the other side's failures in the past (Cameron's been in power for over 3 years) make fracking today inevitable. Like the myths, classic political spin 101. (Don’t get me wrong, I have no more sympathy for Tony Blair or Gordon Brown then for Cameron, they're all the same to me). It’s simple – gas and electric bills can go down when our home-grown energy supply goes up. We’re not turning our back on low carbon energy, but these sources aren’t enough. We need a mix. Latest estimates suggest that there’s about 1,300 trillion cubic feet of shale gas lying underneath Britain at the moment – and that study only covers 11 counties. To put that in context, even if we extract just a tenth of that figure, that is still the equivalent of 51 years’ gas supply. Now, now, now, the spin is starting to spin out of control here (and we're only in the 3rd paragraph). Initial estimates for Poland, which came from the US Energy Information Administration (EIA), had to be slashed by over 90% within 2 years. So, "to put that in context", the UK can count on less than 1% of the initial estimates. This reservoir of untapped energy will help people across the country who work hard and want to get on: not just families but businesses, too, who are really struggling with the high costs of energy. Just look at the United States: they’ve got more than 10,000 fracking wells opening up each year and their gas prices are three-and-a-half times lower than here. Even if we only see a fraction of the impact shale gas has had in America, we can expect to see lower energy prices in this country. Secondly, fracking will create jobs in Britain. In fact, one recent study predicted that 74,000 posts could be supported by a thriving shale-gas industry in this country. It’s not just those involved in the drilling. Just as with North Sea oil and gas, there would be a whole supply chain of new businesses, more investment and fresh expertise. 74,000 jobs. That's the best Cameron's spin doctor could do. What's Britain's working population? 40 million? Hmm. Thirdly, fracking will bring money to local neighbourhoods. Companies have agreed to pay £100,000 to every community situated near an exploratory well where they’re looking to see if shale gas exists. If gas is then extracted, 1% of the revenue – perhaps as much as £10 million – will go straight back to residents who live nearby. This is money that could be used for a variety of purposes – from reductions in council-tax bills to investment in neighbourhood schools. It’s important that local people share in the wealth generated by fracking. This must be my favorite line. You get to keep an entire 1% of what they take away from under your feet. No further comment, your honor. The benefits are clear. But it’s also crucial to put to bed the myths. 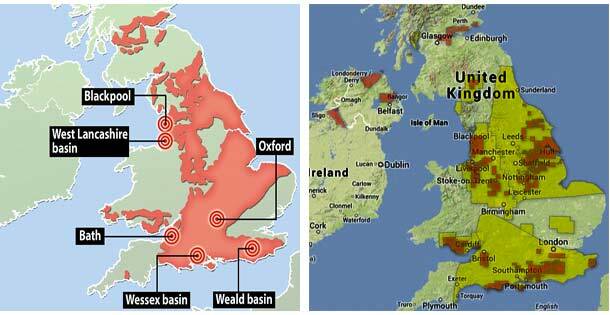 It has been suggested in recent weeks that we want fracking to be confined to certain parts of Britain. This is wrong. I want all parts of our nation to share in the benefits: north or south, Conservative or Labour. We are all in this together. If neighbourhoods can see the benefits – and are reassured about its effects on the environment – then I don’t see why fracking shouldn’t receive real public support. Local people will not be cut out and ignored. We are issuing very firm guidance: firms looking to frack should make people aware of their plans well before they apply for a permit. Dialogue is important and if residents express specific concerns, then companies should take them on board. From my experience as a local MP, people tend not to oppose developments for the sake of it. But what they do object to is the idea that their neighbourhood should change without any say. We want people to get behind fracking, and a transparent planning process is an important ingredient. Equally, we must make the case that fracking is safe. International evidence shows there is no reason why the process should cause contamination of water supplies or other environmental damage, if properly regulated. And the regulatory system in this country is one of the most stringent in the world. If any shale gas well were to pose a risk of pollution, then we have all the powers we need to close it down. In fact, international evidence shows a whole of doubt when it comes to the safety of fracking. First off, oil and gas companies can inject any quantity of any chemical they see fit into fracking wells, and not even a judge can force them to reveal what they are. Proprietary. Business secrets. Second, there are far too many stories about water contamination to just be brushed off the table. That's just irresponsible behavior, and certainly not fit for a government. Third, there are also many reports of earthquakes, in which nobody has conclusively ruled out the effects of fracking and drilling. It may be hard to prove 100%, but that doesn't mean there's no danger. And with a government so obviously so eager to start fracking away, people may be forgiven for asking a question or two about its attention to safety standards. It's not as if Cameron calls for an open discussion, he makes very clear that he wants to start fracking, and he either thinks the discussion's already happened or none is needed. All that stands in his way is what he labels a bundle of myths spread by a bunch of pesky protesters who want that open discussion with him. Unfortunately for him, it's quite simply not true that "International evidence shows there is no reason why the process should cause contamination of water supplies or other environmental damage". The evidence doesn't conclusively show any such thing. There are serious doubts, and they should call for hesitancy, not hurry. When all is said and done, though, one myth still remains – that fracking damages our countryside. I just don’t agree with this. Our countryside is one of the most precious things we have in Britain and I am proud to represent a rural constituency. I would never sanction something that might ruin our landscapes and scenery. Shale gas pads are relatively small – about the size of a cricket pitch. But more than that, similar types of drilling have been taking place for decades in this country without any real protest. The South Downs National Park remains one of the most beautiful parts of Britain, yet it has been home to conventional oil and gas drilling since the Eighties. The huge benefits of shale gas outweigh any very minor change to the landscape. So my message to the country is clear – we cannot afford to miss out on fracking. For centuries, Britain has led the way in technological endeavour: an industrial revolution ahead of its time, many of the most vital scientific discoveries known to mankind, and a spirit of enterprise and innovation that has served us well down the decades. Fracking is part of this tradition, so let’s seize it. Now, Cameron is right to be worried about Britain's energy future. With the North Sea fields largely gone and little else on the horizon, the country finds itself at the very end of a very long pipeline coming from Russia. Norway may help a little, but still. That, however, doesn't mean a hasty plunge into an adventure that has very uncertain future outcomes, both in energy production and in environmental effects, is recommendable. One would hope the historical lessons of using, first, too much wood and, second, too much coal, would at least have lingered in the public mind to some degree. There's zero reason to assume Britsh wells will do any better than that. So it will be drilling more and more wells, faster and faster, until more drilling is no longer economically viable. At that point, anyone want to take a stab at what will happen to energy prices? King Arthur's descendants have some hard choices to make when it comes to their economy, their society and their country as a whole, and it's not as if they're the only ones. Plunging economic prospects and energy supplies will not be easy to deal with. But letting people like David Cameron and the techno-happy religion he represents take the upper hand will only make it worse. 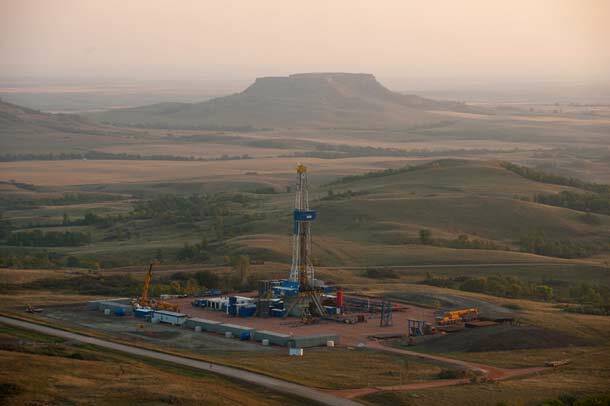 Why not wait a few more years, see what happens to the fracking industry in Bakken, in North Dakota? Demand more reports on the risks of water contamination and earthquakes, tell the industry there's no way they can inject massive amounts of chemicals into British soil not even a government's allowed to know. What if what happened to shale in Poland happens in Britain too, and the whole industry crumbles? Then again, looking at the succession of Thatcher through John Major, Tony Blair, Gordon Brown to David Cameron, it seems safe to say that Britain has a political crisis at least as damaging to its future as its upcoming energy crisis. This topic contains 17 replies, has 1 voice, and was last updated by TonyPrep 5 years, 8 months ago. For those who have been around awhile…. I am still around,still doing bees in the woods in Oregon…still despairing of what I see and what I am witnessing in a country I deeply love.Very busy as Ubileen pears ripened too quickly to get to sale,and now see a avalanche of fruit to make use of…. Yes, that’s what I’ve been trying to convey in my last two posts, that shale/fracking is a get rich quick scheme. And given the numbers, I can’t see a viable industry by 2020 (even 2016 is murky). You can pray for no gas near your land, but just imagine all the guys who haven’t been so lucky. Glad to see you’re keeping up the daily grind, and hope Mrs. Snuffy is doing just fine. I feel ashamed of my current government (note I didn’t vote for them!). They called themselves “The Greenest Government Ever” ha ha!. Never I have a seen a government so dismissive of environmental issues and the views of its people, so short sighted, so unenlightened and so downright stupid!. They are so addicted to the myth of growth, to big business and to magical thinking that it is truly scary. They only see what they want to see. Its just the same as with GM. They expect technology to “save” us. Don’t confuse us with the facts they say, we’ve made our minds up. Thankfully they aren’t drilling near me yet but I feel for those people near Blackpool and in Sussex, lets hope they can make enough of a fuss to delay things before the whole business in shown to be a great big misadventure. btw. I think fracking companies in the UK will be forced to declare what is in the fracking fluid to the Environment Agency, which is better than the US. But for David Cameron to say its safe when properly regulated is wishing thinking, the technology is only so good, and accidents with well casings, etc… will happen, they cannot be wished away, especially is earthquakes have been positively linked to fracking now. US fuel isn’t cheaper because of fracking; it’s cheaper because the US taxes it less. Sounds like your government stands to make the most profit from all this. All that Vat tax and what do they produce for it? Mandatory Fracking. I’ll never understand how folks can look to government for solutions to anything. The bigger they get, the greater the oppression. Next up, carbon tax…or in other terms, the Financialization of the Climate! Cameron had better be careful – if they were to start fracking in his back yard, he might get booted out as locals in frack threatened Balcome, normally a conservative heartland, have said they will look else where come the next election. Though a recent poll suggests that opinion is actually split fairly evenly. However, the biggest opposition is surprisingly not going to be public but corporate – the Uk water companies through the industry group Water UK have challenged the energy industry over safety claims. This is especially prevalent in the UK where water companies annually extract 2,135 million cubic metres of water from the ground and many private householders extract less than 20 cubic a day as you don’t need a licence for less then this amount. This behaviour from governments is happening all over. As I write, the NSW government and Rio Tinto have taken the hapless citizens from Bulga to the supreme court to overturn a rare win by them in the Land and Environment Court recently which blocked the expansion or Rio Tinto’s Warkworth coal mine. To cap this off, the NSW government is amending planning laws to make the “economic benefit” of any mining application the only criteria in granting mining permission. Tough luck if you live near a mine. Note: Cameron was talking about natural gas prices, not gas – petrol – at the pump. 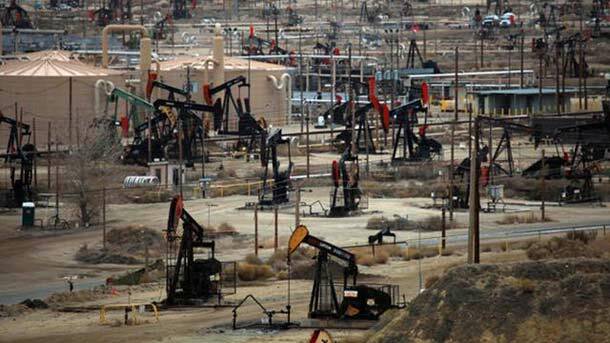 James Kunstler has just recently done a podcast with Richard Heinberg about his new book, Snake Oil: How Fracking’s False Promises of Plenty Imperils Our Future. It raises the issue that current gas prices are too low to sustain the cost of fracking so any claims about ‘fracking’ reducing the cost of gas is a non-sequitur, as prices need to rise to make it even possible – which I think is what you have been saying all along on TAE. 153 additional wells ($1B +) for a little over 10,000 additional barrels per day. Super! It looks like May of this year was very possibly the peak, given the drop off in total production in spite of the continued increase in wells in subsequent months. Also interesting to note that the ramping up of Bakken drilling in 2005 roughly coincided with what some thought (me included) was the peak in worldwide conventional oil production. 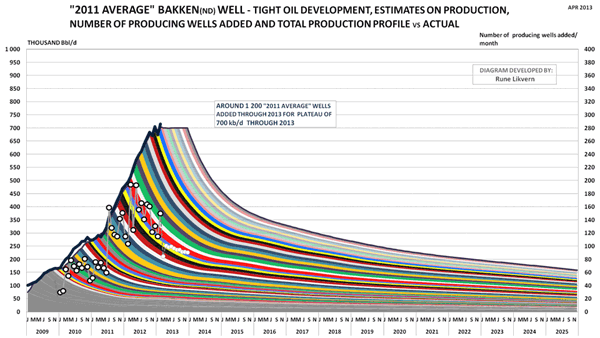 SteveB post=7884 wrote: It looks like May of this year was very possibly the peak, given the drop off in total production in spite of the continued increase in wells in subsequent months. Then again, maybe not. I was looking at the monthly numbers, and May had one more day than June, while the daily amount increased in June. It doesn’t look likely to be something that would hold out past the end of the year, if even the summer. From Is the Typical NDIC Bakken Tight Oil Well a Sales Pitch? I could not quite believe your numbers so I did it for the last 6 months of data – to get a bigger sample. If it costs $8m per well, that works out at a capital cost of $127,205 per barrel/day. If their profit margin – just for the sake of argument – is $30/barrel, this suggests that it takes $11.6 of investment to make $1/year of return. Remember when Nicole Foss used to write for this blog? Good point, Barak. Personally, I’m still waiting for Nicole’s Auckland gig to be finalised – it’s been TBA for months. I’m beginning to think it might be cancelled, even though I’ve waited nearly two months! Good post, though, Ilargi and, as an ex-Brit, I’m sure glad I don’t live there any more, though that clown’s actions affect us all.